The feeling of being squeaky clean and freshly showered is often a much desired but scarcely achieved goal when tramping about in the great outdoors. Wet wipes do a barely tolerable job, take up way too much space, are un-environmentally friendly, and, well I don't know about you, but trying to wash with a pint sized wet tissue designed for a babies' bottom is far from satisfactory in my opinion. 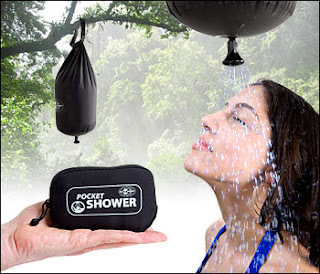 Well the distant dream of being able to have a proper shower in the middle of nowhere is now a reality thanks to the pocket shower. This tiny gizmo unfolds to reveal a high performance waterproof reservoir that holds a mighty ten litres of water. The black fabric will (given a sunny day) warm the water up in no time. You just string it up to a tree and open up the attached shower head - hey presto, you can now luxuriate in a seven minute shower, get squeaky clean, and gloat at the wet wiped masses, and it packs up into a neat package smaller than your fist. Beat the pong with the Pocket Shower.